(Bloomberg) -- U.S. refiners are turning away from Venezuela -- literally -- after the Trump administration imposed sanctions on Petroleos de Venezuela SA and the state-owned oil company responded by demanding upfront payments for crude. 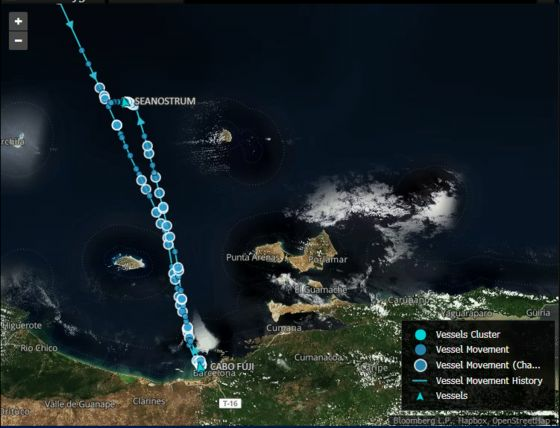 A tanker booked by Valero Energy Corp. left the Jose oil terminal this week without loading crude, according to ship-tracking data compiled by Bloomberg. The Seanostrum was scheduled to load Wednesday, but has turned around and is heading away from Venezuela. Chevron Corp. is considering rerouting a tanker, the Cabo Fuji, that’s waiting to load Venezuelan crude, according to a person familiar with the situation. The U.S. major is expected to make a decision this week. Under the U.S. sanctions, refiners buying crude from Venezuela would need to deposit payments for the oil into an account that PDVSA can’t touch. U.S. President Donald Trump recognized National Assembly leader Juan Guaido as the interim president of Venezuela last week in the most provocative move yet against the leftist regime of Nicolas Maduro.